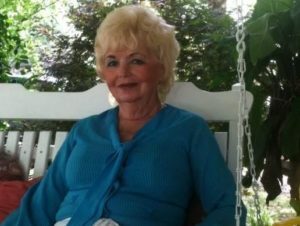 Evelene Crocker Harkins, 79, of Simpsonville, went to be with the Lord Jesus Christ on Sunday, February 10, 2019 while surrounded by her family. Born in Woodruff, she was the daughter of the late Charlie Crocker and the late Jessie Rhodes Crocker. Evelene is survived by two daughters, Wanda Ballew and her husband, Jeff, of Simpsonville and Malinda Kennedy and her husband, Brian, of Woodruff; six grandchildren, Mandy Black (Andy), Jason Medlin, Cleve Stewart (Dena), Chris Stewart (Jessica), Chase Stewart (Ashley), and Ashley Davis (Justin); and sixteen great grandchildren. In addition to her parents, Evelene was preceded in death by three brothers, Charles Crocker, Caroll Crocker, and Grady Crocker; and a son Jerry Rhodes. A Celebration of Life will be held on Wednesday, February 13, 2019 at Heritage Funeral Home in Simpsonville from 5:00 pm to 8:00 pm. In lieu of flowers, the family requests that memorials be made to Little Steps, PO Box 5285, Greenville, SC 29606. Wanda, Jeff, Mandy,Jason and the rest of the family were so sorry for your loss. I remember how caring and friendly your mom always was. As we sat at the apartment when we were both pregnant. God bless you and the family in this time. Hello Darling! Who can think of Evelene and not think of Conway Twitty? I know Conway met her as she arrived. We would listen to Conway all the way to Tn. Evelene always made me smile. I loved her very much and loved her biscuits and gravy. I know all of you will miss her very much. Just as I do. Wanda, I am so sorry for your loss. Wanda, Malinda so sorry for your loss. You both have so many happy memories to share. Evelene so enjoyed life when we were growing up. She was the best looking Mom in town, especially when she cut the lawn. I also remember Conway & Tammy playing often, in fact Mandy should know those songs in her sleep. You will miss her each and everyday, not that time heals but you will enjoy the memories so much. I Love you both. Wanda and Malinda I am so sorry for your loss.I have so many memories of your Mom when we were in High school. We are so sorry to hear of the loss of your mother. She was always so kind to us when we were children and a wonderful neighbor. Prayering the God wraps His mighty arms around each of you and grant you His peace and comfort that passes all understanding!